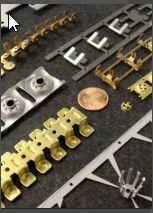 These products are typically created using metal stamping machines and processes. There are three main types of metal washers: plain, spring, and locking washers. A plain washer usually takes on the role of distributing a load, as described above. Spreading the load from a fastener over a larger area helps prevent damage to the fastened surfaces. Plain washers can also be used as spacers between the fastening head and other surfaces. Spring washers, on the other hand, are specifically manufactured to prevent fasteners from loosening due to vibrations. Locking springs are designed to prevent fasteners from unscrewing and thus loosening. Most locking washers are also spring washers. Each of these categories of washers contains many other different kinds of washers which are more specifically designed for particular applications. 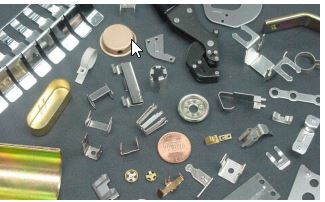 Metal stamping is the primary method for manufacturing the majority of washer types. While it is possible to order custom washers, most applications do not require special or unique washers. For this reason, metal stamping companies are able to efficiently manufacture large quantities of washers very quickly. Due to the speed and volume of washer production, washer manufacturers can also create a large variety of standard washers with varying inner and outer diameters. The metal stamping process also allows washers to be created from a multitude of different materials. Washers are most commonly manufactured from steel or stainless steel but can also be made from aluminum, brass, cobber, iron, zinc, and titanium. Therefore, customers can easily find cost-effective standard washers for essentially any application. Metal Washers Metal washers are devices used primarily to distribute the load of a fastener over a greater surface area. Most washers are disk-shaped metal plates with a hole through the middle to allow a fastener like a bolt or screw to pass through.